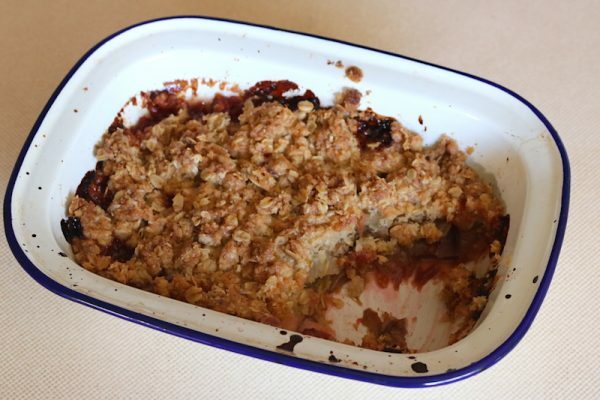 There’s so much right with a warm dessert from the oven, and an apple crumble has got to be one of the best warm desserts there is! This recipe has a healthy twist on the original, but losing none of its sweetness and comfort factor. White sugar has been subbed out for organic coconut sugar, and the usual white flour is now wholemeal, but do feel free to sub spelt or even rye if your family can handle the flavour – it has a sweet nuttiness that pairs really well with the juicy fruit and can be a pretty easy way of introducing other flours to your family if they’ve otherwise been reluctant. Organic quinoa flakes can also be used instead of the traditional oats, which will lend a real crunch to the topping, and even coconut oil can be used instead of the butter: it’s pretty hard to get this extremely versatile dish wrong! In large baking dish, spread out the rhubarb and sliced apple, and sprinkle with the quarter-cup of coconut sugar. In a large bowl, add the wholemeal flour, oats, butter, coconut, pinch of salt, and brown sugar. Rub the butter into the ingredients with your fingertips until well blended and the mixture is in small lumps. Top the fruit with this mixture and place in the heated oven. Bake 30-40 minutes until the crumble top is golden and the fruit below is cooked through. The juices should be bubbling along the edges of the dish and it should smell amazing!